While pizza and pasta are just the tip of the Italian iceberg, there is a reason these two culinary staples are the most beloved exports from Italy. 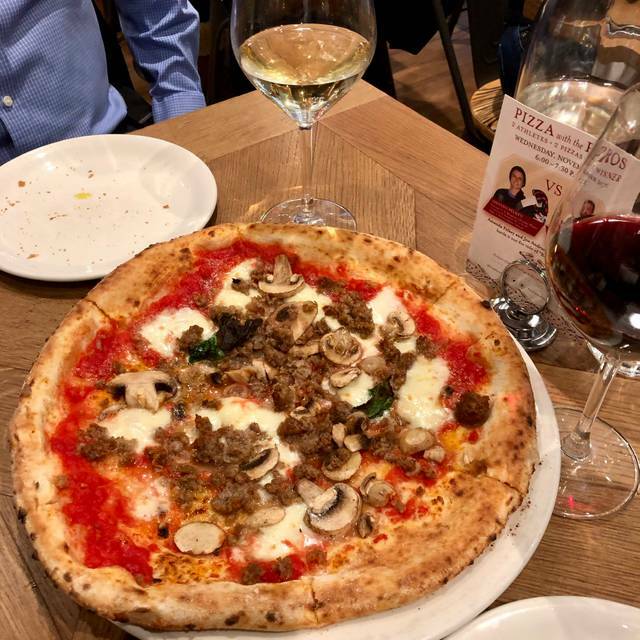 Enjoy Eataly Boston's seasonal selection just steps away from where their expert pasta chefs and dough-slinging pizzaioli (pizza makers) create dishes before your eyes. Served simply with extra virgin olive oil & sea salt. Step 1: Select your mozzarella, Step 2: customize with salumi & verdure, Step 3: buon appetito! Negroni in a Bottle Baby! My favorite pasta ever. Highly suggest the bucatini all'amatriciana - it's sinfully good! Food was absolutely delicious!! Can’t wait to go back! Really bad ceased salad. Had. Almost no. Dressing. Pizza lunch special was mediocre at best. The traditional Margherita pizza we ordered only had a single leaf of basil. One little, itty bitty, basil leaf. 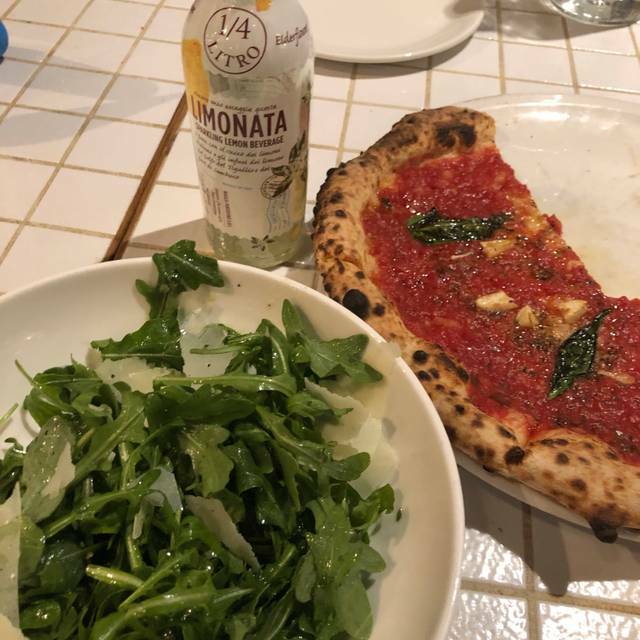 What's a ironic is that the painting on the wall in the back of the bar depicts a Margherita pizza but the painting shows the pizza with four basil leaves, not one. Love Eataly food and wine. I do thin it is a bit pricey. Celebration dinner for 2018 Boston marathon champion Des Linden. Awesome meal and service! Sat my large party on Marathon weekend promplty! Very tasty real Italian food!! The lunch sets also have good varieties. The food was delicious but all of our courses came at the same time. Apparently the cold dishes come from one kitchen and the hot courses come from a different kitchen. Great dinner during a conference. The food was OK. Nothing special. The pizza is worth trying! The service was awful. We had to wait for 20 min for our table. In addition the servant was too aggressive and rude with us. He wanted us to get out ASAP and he never gave us enough time to choose our food/drinks. Very rushed and very impolite! Eataly is overated as are the restaurants there~crowded, small, noisy...a glorified cafeteria which is exactly what this reservation gave us. Basically a food court. Food was average. I asked my waiter for a side of ricotta for which I offered to pay for; he responded “Well, I could find some, but we frown on ordering things not on the menu.” He never did. Our bill for our cafeteria experience was $500.00 for 8 people. Tuscan Market place in Salem offers no crowds, better food/quality and prices if your looking for a shopping/dining experience. La Pizza & La Pasta has a fun, energetic vibe. The service is fantastic and the food was great. Four of us ordered an appetizer and 4 dishes to share for lunch. We had 2 pizzas and 2 pastas and everything was fresh and delicious. Can't wait to go back! Best pizza you will have anywhere in the world. Period. Love the markets and ambiance. But food disappointed and over priced. We were 8 people..all ordering different menu items. Everyone had same feeling. Food was..so-so..Not great. Over priced. Good food. The waiter was good when he was around, but maybe a little too busy because he didn't come back for a while. The whole concept of pizza and pasta was great. However, it's a bit overpriced to go often. Superb 👌 Exceeded our expectations completely, wine and food were spectacular and fairly priced, but it was the staff and atmosphere that were really striking. At La Pizza & La Pasta, Sloan, the manager, was attentive, observant, and very sweet, while our server, Tommy was very informative and friendly. Loved our experience overall- was a special occasion made even better by a wonderful night. Overrated. Overpriced. Food was average and the pizza was not crisp. Delicious food however we felt we were being rushed out so they could fill the table with someone new. We sat less than an hour. Otherwise wonderful experience! Was my husband’s birthday and he’s wanted to check out Eataly. Upon learning of my husband’s b-day, the manager poured us 2 glasses of Prosecco- very nice! The place was crazy busy, but our server was attentive, helpful, and realized we were going from there to a show. Had two delicious pasta dishes that we shared. We weren’t rushed, but the server was sensitive to our timeframe. Nice job Eataly! Wonderful food. Rare to get authentic Italian in US. Ingredients and flavors delight the palate. Some of the dishes were amazing, while others missed the mark. We also felt a bit rushed during our reservation. Main courses would come while we were still working on the appetizers and we had no room on the table to have both plates. The carpaccio and cacio e Pepe dish were incredible though. And amazing Italian wine selection. The food wasn’t great, my friend and I are glad we tried this place during the food fest week because it really isn’t worth it. The staff was kind but not attentive and not as kind once they were really to check you out. I don’t see myself coming back to Eatly for food. For a quick business lunch this fit the bill. Had an 11:45 am reservation to get ahead of the lunch crowd and it worked perfectly. Appreciate the team approach of multiple servers so you're never waiting for one person to help you. 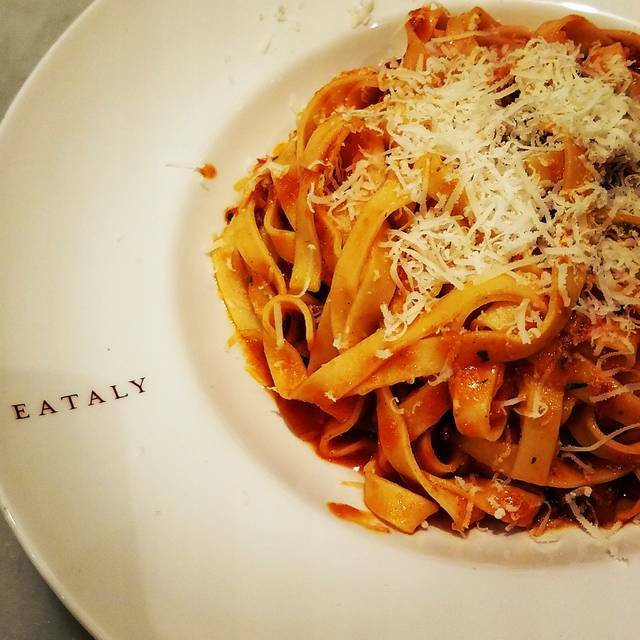 Wonderful lunch at Eataly. One of the most special places in Boston for a get away dinner with high quality food! Just pure fun!! Our Server, (Luis?) was knowledgeable and very helpful. His service was great. The food could have been tastier...something was missing in each of our dishes. The Broccoli soup was delicious. The entire store lacked employees who knew where we could find items....maybe a few ‘floaters’ would be helpful. The girls making pasta were friendly! I have a severe nut allergy and carry two Epipens with me at all times. The waiter assured me that what I was ordering would be safe for me to eat. When a different waiter brought out our food and placed my pasta in front of me, it was covered with chopped pistachios. My husband and I were horrified. We explained to the waiter and to the manager what happened and that they need to seriously review their allergy procedures, and we left. Food was average at best. Very plain Jane. However, prices are not. My recommendation is to head over the North end of Boston for Italian food. This place will leave you disappointed. Upscale fast food in a busy noisy space. Know what it is and you won’t be disappointed. Food is very good, as should be expected given the locale. Service is at a minimum. I liked coming here a lot. The food and service were very good. I wouldn’t do it for a special occasion but for lunch or casual dinner it’s perfect.